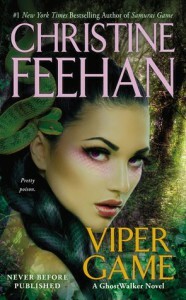 After waiting so long for another installment in the GhostWalker series, Viper Game did not disappoint!! What I liked: The world building in the GhostWalker series is constantly growing and evolving. You can never tell from one book to the next just what is going to change. I've been reading this series from the very beginning. It's imaginative, unique and addictive. I was wondering if we would ever get any more stories set in the swamp and with the Fontenots. I think everyone who reads this series loves Gator and Nonny and now we get the story of one of Gator's brothers, Wyatt. How Ms Feehan can invent the genetics and psychic abilities of her characters is a bit mind boggling. It's always a treat to see what combination she is going to come up with and she doesn't make it easy on herself either. Some of the abilities are so strong and out of control, the character is just along for the ride and trying to survive. In Viper Game, I almost had the feeling the two main characters, Pepper and Wyatt had a bit of a dom/submissive relationship. It didn't feel contrived but Wyatt is very dominant as are all of the GhostWalkers but this installment had that vibe more than the other books. What I didn't like: The trust took a long time to develop between Wyatt and Pepper. I did get a bit aggravated with Pepper and her insecurities but based on her back story, it made sense. Overall, an action packed read and I fell in love with two new characters introduced in this story. I am wondering not only will they be the lead couple in the next book, but how long we will be waiting for the next installment!! !